In the search bar on Facebook type in your city and see what comes up. 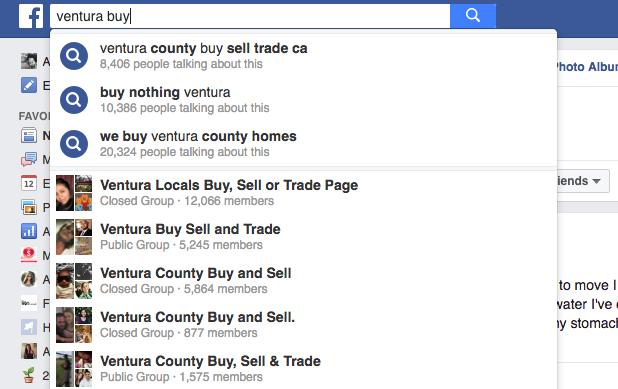 You can try typing things like “City Buy Sell” or “City For Sale”, etc. Try a bunch of different combinations and I’m sure you’ll be able to find a couple groups. Personally, I only join the bigger groups and don’t even bother with the groups with only a few hundred people in them. The bigger groups have a larger audience of people who might buy your stuff and are just faster moving in general. Sometimes you’ll even be able to find local groups for specific types of items like Kid/Baby items or Furniture. Just search around and join the groups you think might be a good fit for you. Tip: Make sure when you join a group you read the rules (it’s usually a pinned post at the top) carefully and kind of watch how people interact. It can be easy to just kind of jump in and accidentally break a rule you didn’t even know existed. Take a picture. Seriously don’t even try selling anything without a picture. The great thing is you can pretty much do it all from your phone using the Facebook app or the Facebook Groups app. 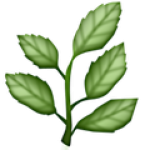 Go to the group and click “Write Post” or “Sell Something”. The difference with the “Sell Something” type of post is that there is a place for a title, price and location. Then you can also mark it sold which is helpful. Honestly, I’ve done it both ways and it will work either way. Mention where you’re generally located if your city is pretty large or if the group covers several cities. Usually the name of your neighborhood or some main cross streets works just so anyone interested knows how far they have to drive. It’s really super easy. Some days I’ll list several items in 15 minutes and have them sold by the end of the day. Stuff out of my house AND make a little fun money while I’m at it? Win win. Below I’ll show you some examples of stuff I’ve sold on Facebook recently. 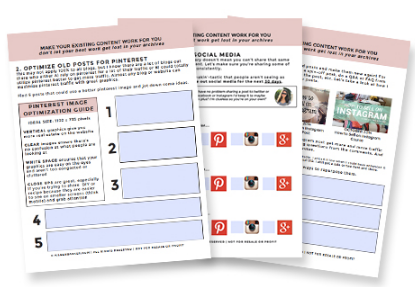 I know it’s easier to get an idea of how to do things if you can see examples of how I do the title, description, photos and pricing. 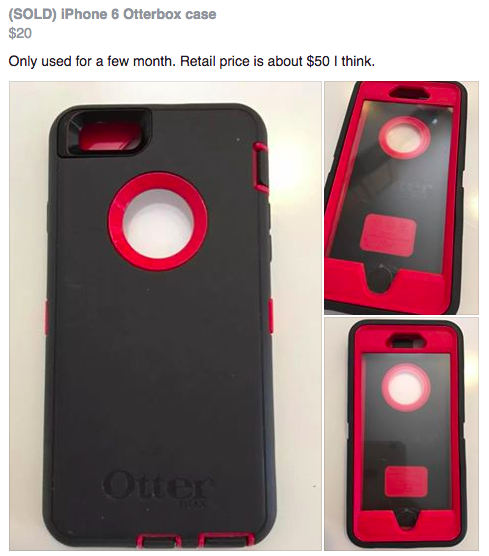 Otterbox iphone case. Paid nothing (got it free when I fixed my broken screen), sold for $20. 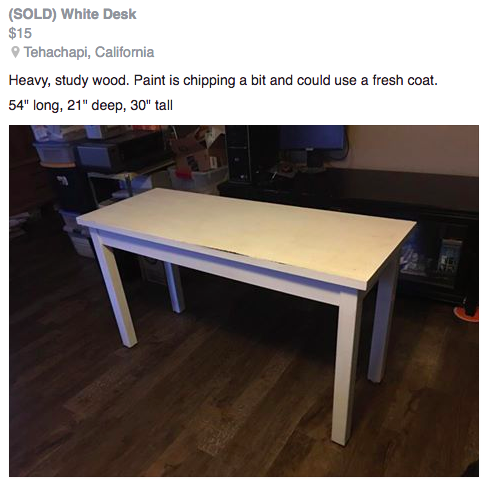 White desk, sold for $15. I actually had several people in line for this one! How cute is this?! 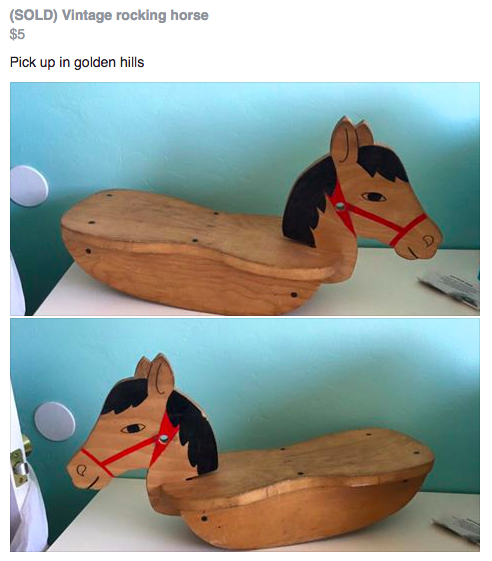 I actually grabbed it at Goodwill for $2.99 thinking I’d use it in my sons room as decor, but changed my mind and sold it for $5 pretty quickly. 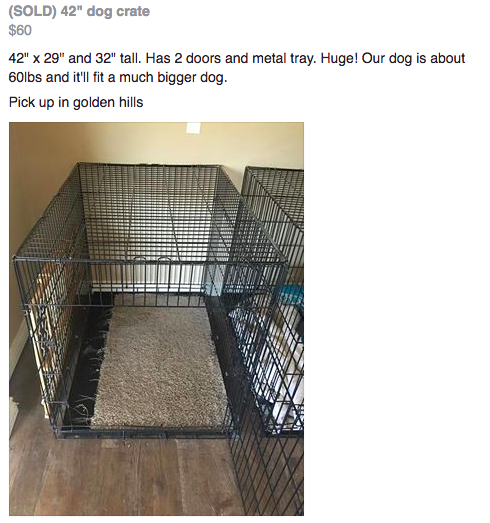 Since we’re downsizing our house I wanted to downsize our dog crates since our dogs aren’t really that big. Took a couple days, but I sold this one for $60. This is an example of one where my husband was super impressed. I was cleaning out the stuff under the sink in the bathroom and just threw everything we didn’t need in a box. Most of it was half used (not gross stuff, just lotions, shampoos, etc), but some of it was brand new. I just listed the whole box for $20 (the new items were worth at least that) and I had 8 people in line who wanted the box. 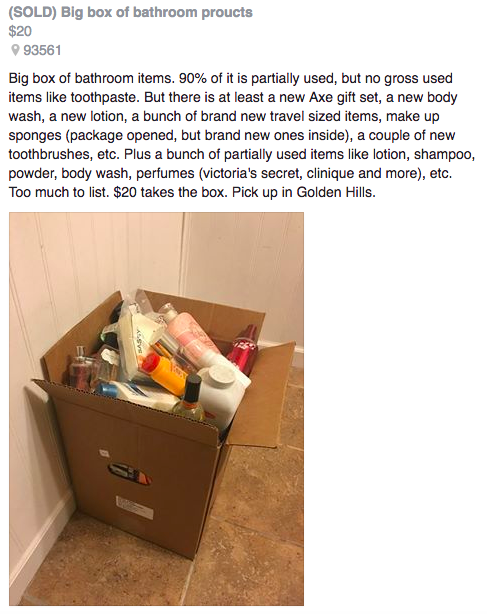 Sold another similar (smaller) box from our other bathroom for $10 a week later. 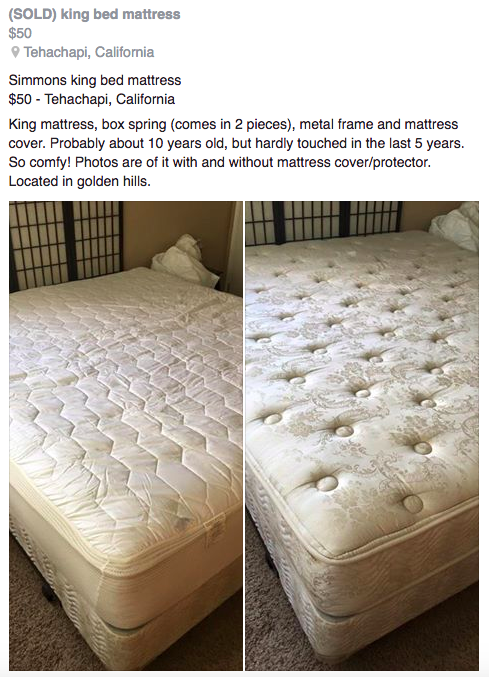 Made $50 on my moms old mattress and then even listed a brand new sheet set for $30 in the comments. Made $80 and got the bed out of the house within 2 hours of posting. I could show you dozens of listings, but I think you get the point! Since we’re about a week away from moving I’ve been selling more than I usually do, but I usually make at least a few hundred bucks a year doing this. 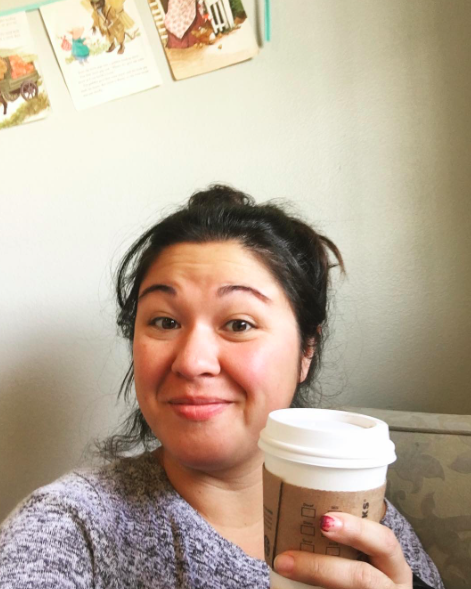 It’s super easy and it’s stuff I don’t want cluttering up the house. 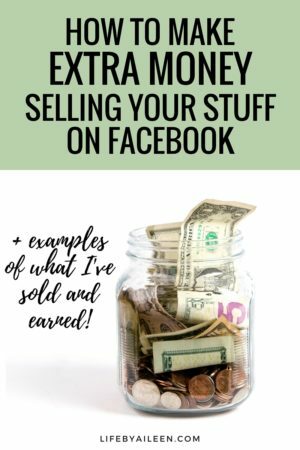 Have you started selling items on Facebook? I’d love to hear in the comments below!